The PHTM20BT infrared thermometer is the latest in health technology. 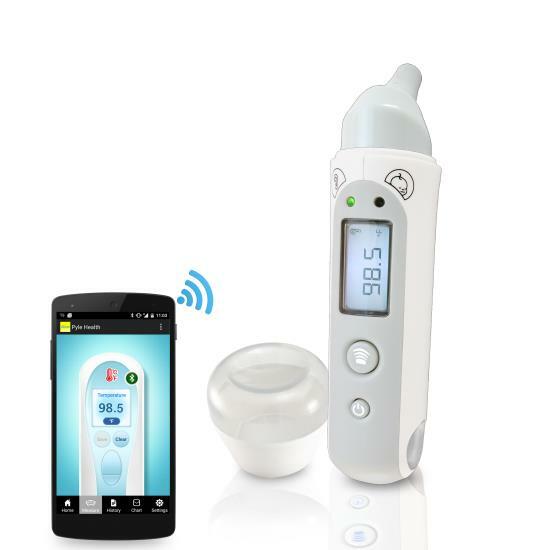 Instantly take the temperature of an adult, child or baby with just the press of a button. Quick and easy operation allows you to switch between ear and forehead measurements for the convenience and safety of all ages. Download the free ‘Pyle Health’ smartphone application and wirelessly transmit temperature data via Bluetooth technology to your mobile device or tablet. The Pyle Health app saves your temperature readings, allows you to view the history of your past readings and the integrated calendar system keeps it all organized. The app also allows you to share your temperature readings with family, friends or your doctor. Use the Pyle Health app to connect to other Pyle Health products and keeps track of all your important health data, like blood pressure, weight, blood glucose, cholesterol and body temperature. Keep track of your health with the ‘Pyle Health’ App and the Digital Bluetooth Thermometer!